It was the fourth day of the Fifth Zionist Congress in Basel, Switzerland in 1901. The delegates had spent the day debating a proposal for the establishment of a national fund to purchase land in Ottoman Empire controlled Palestine, as had been suggested at the first Congress four years earlier by mathematics professor Zvi Hermann Schapira. Although Schapira had died in the summer of 1898, the idea of a fund had won a large following. Yet three congresses had passed without any practical decision being taken. At times it seemed that the dream of a Jewish state was destined to remain just that--only a dream. 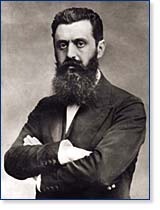 But Theodor Herzl, a Viennese journalist, was unwavering--it was time to take action, and he was determined that before the Congress came to an end, a national fund would be established. Herzl stood before the delegates and delivered a passionate plea for the immediate establishment of the fund: "After striving for so many years to set up the fund, we do not want to disperse again without having done anything." His speech turned the delegates around, the motion passed and the congress resolved that a fund to be called Jewish National Fund (Keren Kayemeth LeIsrael) should be established, and that "the fund shall be the property of the Jewish people as a whole". JNF's first undertaking was the collection of £200,000. One of the delegates immediately pledged £10 in memory of Zvi Hermann Schapira. Herzl made the second donation and his aide, the third. And with this, the dream of a national fund—to be used to build the foundations of a Jewish state--became a reality. One month after the fund was established, Yona Krementzky was appointed to head JNF-KKL, headquartered in Jerusalem and he set to work immediately. Krementzky initiated the Golden Book, which records special moments in the lives of inscribers, or those they wish to honor paid inscriptions which to this day remain a coveted badge throughout the Jewish World. These beautiful books are housed at JNF-KKL headquarters in Jerusalem for all to see. The very first inscription was that of Theodor Herzl. Krementzky also began publishing JNF stamps, the proceeds of which went into the fund. These stamps were affixed to official Zionist documents as well as personal letters, and many people collected them. The first stamp was issued in 1902 and showed the Star of David and the name "Zion." Krementzky also adopted the suggestion of a small-town Galician bank clerk, Haim Kleinman, who had written to the Zionist movement's newspaper Die Welt, proposing that a collection box be placed in every Jewish home so that contributions could be made to JNF at every opportunity. In the period between the two World Wars, about one million Blue Boxes could be found in Jewish homes throughout the world. In the spring of 1903 JNF-KKL purchased its first parcel of land: 50 acres in Hadera with funds given as a gift by the well-known philanthropist Isaac (Yitzhak Leib) Goldberg. In 1904, JNF-KKL was called upon to carry out its first mission: financing the expenses of Jewish scientists, which was the start of JNF-KKL's work in research and development. By 1905, JNF-KKL's land holdings had expanded to include land near the Sea of Galilee, and at Ben Shemen in the center of the country. JNF-KKL bought yet another area in the center of the country at Hulda. The land at Hulda was bought for a very special purpose the planting of olive groves in memory of Herzl and with this, JNF-KKL embarked on a new venture: afforestation. In this first decade of its existence, land acquisition was not JNF-KKL's only concern; JNF-KKL played a central role in establishing the first modern Jewish city Tel Aviv, acquiring land for the first collective community (known today as kibbutzim) and first workers' community. JNF-KKL also set up and administered farms, continued its afforestation programs, which laid the foundation for JNF-KKL to become the leading environmental agency in the land of Israel, and was instrumental in founding secondary schools and pioneering higher education an impressive record of achievement in a country whose Jewish population at the time numbered only 85,000. It was also in this period that JNF-KKL set up an experimental agricultural station at Ben Shemen under the direction of Yitzhak Wilkansky, whose work in mixed farming, or crop diversification, remains the basis of most Israeli agriculture to this day. In July 1920, representatives of Zionist organizations from all over the world convened for the first time since the outbreak of World War I to discuss a course of action. It was decided by the representatives that the land which had been purchased for Jewish settlement belonged to the Jewish people as a whole, and that JNF-KKL's function was to use its donations collected from Jews around the world to acquire land which would be allotted to settlers by inheritable leasehold. By 1921, JNF-KKL purchases of land had quadrupled its land holdings, bringing them up to 25,000 acres. From its very inception, JNF-KKL was dedicated to practical work, but its educational and informational activities went hand in glove with this work. At the start of the 1920s, the world Jewish population numbered some 15 million people, scattered throughout 76 different countries. JNF reached out to every Jewish community, regardless of size or distance. JNF's voice was heard not only in asking for contributions, but also in Zionist education, which helped to connect Jewish communities to the homeland. This is a leadership role the organization still plays today. JNF's Blue Box stood in hundreds of thousands of Jewish homes, schools, synagogues, public buildings and businesses. JNF made it possible for every Jew--whether man, woman or child--to become a partner in the Zionist enterprise and be personally involved in the development of the land. On January 26 1926, Jewish National Fund was incorporated in the United States, developing a uniquely American effort to support development in Israel. Its six action areas include ecology and afforestation; water; community development; research and development; tourism and recreation; and education. Leaders of the new US organization included Bernard A. Rosenblatt, Isaac H. Rubin, Irma L. Lindheim, Rabbi Meyer Berlin, and Israel Matz. JNF-US continues to play an important leadership role in the JNF family as the largest contributor to JNF-KKL in the world. In 1991, JNF-US founded the International Arid Lands Consortium, partnering for the purpose of promoting scientific research with the University of Arizona, Desert Research Institute-Nevada; Higher Council for Science and Technology-Jordan; University of Illinois; Ministry of Agriculture and Land Reclamation-Egypt; New Mexico State University; South Dakota State University; and Texas A & M University-Kingsville. In 1927, JNF-KKL purchases totalled 50,000 acres of land on which 50 communities stood. In 1928, planting began for Balfour Forest near Kibbutz Ginegar, and Mishmar HaEmek Forest. By 1935, JNF-KKL had planted 1.7 million trees over a total area of 1,750 acres. Throughout this period JNF-KKL continued to reclaim land for agricultural purposes and drain swamps like those in the Hula Valley. At the end of 1935, after 15 years of tireless effort, JNF held 89,500 acres of land on which stood 108 communities. Most of the land was in the center of the country and in the valley regions. In 1939, despite the severe restrictions imposed on Jewish immigration by the British mandate authorities, there were 450,000 Jews in the country, 10% of whom lived on JNF-KKL land. The Zionist Congress of August 1939 convened under a shadow of dread for the future of European Jewry. In September, World War II broke out, the extermination of six million Jews across Europe began, and the need for a Jewish homeland became ever more urgent. During the summer of 1939, the British had issued official prohibitions against establishing more communities in new areas. The only avenue of resistance remaining to the Jews was to go on purchasing more land despite the British laws. JNF-KKL initiated Operation Tower & Stockade. Under the cover of darkness and amidst the constant threat of discovery, ten cities were built overnight on land owned by JNF-KKL. In order for JNF-KKL to fulfill its new tasks at a time when land purchase had become increasingly difficult, complex, and expensive, a great deal of money was required. Despite the hardships of war, funds raised from Jews around the world increased considerably. Land purchase increased steadily in the first three years of war, and by 1942, sixteen new communities had been set up on JNF-KKL land. Keeping with David Ben Gurion's notion that settlement of the Negev was "rapidly becoming the central issue," JNF-KKL deemed it the organization's duty to settle and develop Israel's south. In addition to settling the Negev, JNF-KKL continued to build Kibbutzim and outposts, and to develop the Galilee in northern Land of Israel. One such camp went up in Biriya, which was built on a mountainside near Safed. It was settled by a religious Palmach unit and became a legend after surviving three attempts to dislodge the pioneers by British tanks and constant demands to vacate. When the war ended in 1945, the true and terrible magnitude of the catastrophe that had befallen European Jewry was realized. Yet in the summer of 1946, it became clear that the British planned to confine Jewish settlement to a small autonomous region and keep the entire southern region of the country as a British protectorate. But by the end of the war, JNF-KKL's land holdings had expanded tremendously, and the Zionist Executive decided to launch a large-scale settlement program throughout the Negev, in the very heart of the banned territory. JNF-KKL was called upon to help plan the operation of settling the lands it had bought over the past five years. Throughout the three years between the end of World War II and the proclamation of the Jewish State, JNF-KKL continued its remarkable activities: afforestation, land reclamation, and assistance to communities. It was also responsible for all the communities of the Negev until the end of 1948. On May 14, 1948, with the withdrawal of the British forces ending the League of Nations-United Nations Mandate, the decision was made to proclaim Israel's independence. Declaration of Independence for the new State of Israel was voted on at JNF-KKL headquarters in Tel Aviv. In May 1948 the Jewish population of the State of Israel numbered 650,000, scattered over some 305 towns. Two hundred and thirty three of these towns stood on JNF-KKL land. Upon statehood, JNF-KKL worked on planting forests and reclaiming the land for agricultural purposes, providing employment for thousands of new immigrants. In 1951, JNF-KKL celebrated its 50th Anniversary, and the realization of its most revered dream--a Jewish state. With Israel's War of Independence over, hundreds of thousands of immigrants began streaming into the newly established nation. The first arrivals were housed in makeshift towns and villages, and when those were full, tent cities were set up throughout the country. By 1951, Israel's population had doubled. Before independence, JNF-KKL's principal task had been the purchase of land for settlement. After the war, JNF concerned itself with enterprises that were central to the building of the State: settling new areas; absorbing immigrants and providing them with employment working the land; reclamation for agricultural purposes; afforestation and development projects. In the Fifties, intensive afforestation began in the Upper Galilee and development continued in and around Jerusalem , where the Martyrs Forest was planted in 1951 in memory of the victims of the Holocaust. In 1960, Israel's Knesset adopted a Basic Land Law based on JNF-KKL's principle of national land, which stated that land owned by the Jewish People and maintained by JNF-KKL cannot be sold, but only leased for periods of 49 years at a time. In 1963, communities were established in the Galilee during Operation Sus (Hebrew for "at last"). The first community was established at the edge of northern Samaria, and a year later, two communities were established in Wadi Ara. It was during Operation Sus that communities were established along the winding mountainous border with Lebanon. In 1965, Joseph Weitz, JNF-KKL Director of Land and Forestry from 1932-1972, shifted his gaze to the south in order to settle the frontiers along the Negev border. Although this is a very arid region, Weitz envisioned rolling back the desert with trees, creating a security zone for the people of Israel. The planting of The Yatir Forest, named after the remains of the Israelite biblical town Yatir, began in 1965. The forest was planted in a region whose low rainfall made it seem unsuitable for afforestation. The Yatir Forest, however, defied the odds and grew to be one of Israel's largest and most beautiful forests. On the eve of the Six Day War, strategic roads were carved out on Mount Gilboa, among other places, to help Israelis travel safely between communities. The Six Day War of 1967 started a fresh page in the history of Israel. JNF helped develop the Rafiah region and the southeastern border area running down to the Arava, contributing to new settlement efforts from the Dead Sea to the Red Sea, at Mitzpe Shalom, Ein Gedi, Neot Hakikar, Ein Yahav, Grophit, Yotvata and Eilat. Dozens of moshavim in the Galilee and the Judean Hills were also expanded for second-generation farmers, and land was prepared in record time for the Pit'hat Shalom (Peace Salient) settlement bloc in the northwestern Negev, to relocate Sinai settlers following the Peace Treaty with Egypt. During this period, country-wide afforestation accelerated the number of trees planted in JNF-KKL forests reached 100 million. As the 1970s began, Jewish National Fund began to open its forests to the public. JNF-KKL's forests were planted not just for ecological reasons, but for the enjoyment of all Israelis. All of the natural scenery and beauty that JNF created began to draw Israelis closer to nature from the forests to the parks, to the new vistas, trails and communities. In response to demand for outdoor recreation areas, large parks such as Goren Park in the Galilee and American Independence Park west of Jerusalem were established. Hundreds of picnic areas, forests, and parklands were developed during this period. Work accelerated on the green belt of forests and parks surrounding Jerusalem. Many of these were created in unexpected places--at Yatir in the southern Hebron Hills, the Eshkol region in the cleft of the southern hills and others in the Negev, on the edge of the desert. Be'er Sheva, the capitol of the Negev, was ringed with groves and forests. JNF-KKL also expanded its afforestation activities, carried out tourism infrastructure, responded to the national challenge by increasing its assistance to alleviating Israel's acute water shortage, undertook extensive drainage works in the Jezreel Valley to help reduce their salinity and restore their agricultural fertility, and helped to absorb a wave of newcomers from the former Soviet Union and Ethiopia. Land infrastructure was prepared for tens of thousands of housing units, creating new jobs through developing tourism infrastructure and hosting immigrant children at JNF-KKL summer camps. JNF-KKL spread out to the south, to the edge of the Arava. Some 25 percent of all tree plantings in the 1980s were carried out in the Negev, bringing its forest area to a total of 45,000 acres. Army camps that had been set up in the Negev after the evacuation of the Sinai were planted with JNF-KKL trees to create shelter from the burning sun, shield soldiers and equipment from dust storms, and provide some respite for those soldiers stationed in the harsh desert. JNF-KKL began to focus a large part of its attention on the burgeoning water crisis during this period. Towards the end of the 1980s, JNF-KKL carried out a number of large-scale water conservation projects, building dams and reservoirs. These vital projects allowed JNF to capture rainwater run-off when the infrequent rains did fall, water which would have otherwise been lost to the sea. Reservoirs were built in the Arava Valley, at Reshafim in the Beit She'arim Valley, and at Kedma near Kiryat Gat. An artificial lake was built in Timna Park in the southern Negev. Infrastructure was developed for tourist sites on the shores of the Sea of Galilee and at Sataf, where biblical farming techniques were brought back to life. Major archeological projects were also undertaken during this time, including the excavation of the Roman city of Scythopolis at Beit She'an and Jabotinsky Park at Shuni. The 1990s brought about new challenges in Israel. JNF-KKL started to rehabilitate the Hula Valley through the Hula Valley Redevelopment Project, the largest environmental project in the Middle East. The project was undertaken in order to prevent the flow of pollutants to the Sea of Galilee, restore fertility of agricultural lands, and expand regional economic opportunities. JNF-KKL took a leadership role in the resettlement of over 1 million Russian and Ethiopian Jews in Israel during this period, and was integral to the success of these efforts. Through Operation Promised Land, JNF-KKL provided the infrastructure for housing the new citizens, many of whom had arrived in Israel with little more than the clothes in their backs. JNF-KKL also helped to alleviate unemployment by hiring many of the new immigrants in its forests and other land development projects. During this period, JNF-KKL also worked on developing tourism sites, continuing its assistance to Israel's water economy and developing Negev farming communities through "Blueprint Negev". JNF-KKL also initiated activities to help rehabilitate Israel's rivers and streams. Dozens of new reservoirs were created during this time. JNF-KKL also turned its attention to improving the quality of life for Israelis by building accessible to handicapped parks, security roads along the Northern Border with Lebanon to safely transport children to school, and recreational areas where Israel Defense Force soldiers could spend time with their families, and created respite programs to take children out of conflict areas for time away at JNF-KKL campsites. JNF’s cooperation with the United Nations and its agencies included participating in conferences sponsored by UNESCO and the UN Environmental Program. Since its founding in 1901, Jewish National Fund has been a vital part of Zionist history, achieving its goal of purchasing the land that would become the State of Israel, helping to develop that land into a thriving nation, and protecting Israel's environment. Over the past century, the JNF family has planted over 240 million trees, built over 180 dams and reservoirs, developed over 250,000 acres of land, created more than 1,000 parks throughout Israel and educated students around the world about Israel and the environment. Through the support of donors around the world, the JNF family was able to ensure that Israel was the only nation in the world to end the 20th century with more trees than it had at the beginning. In addition, over the past decade, JNF has increased its water resources to furnish water to more than 1.2 million Israelis. As a global environmental leader focusing on Israel, JNF is committed to the United Nations Millenium Developmental Goals of 2015 and its partnerships with Israel’s neighbors, improving the quality of life for all who live in the Middle East.